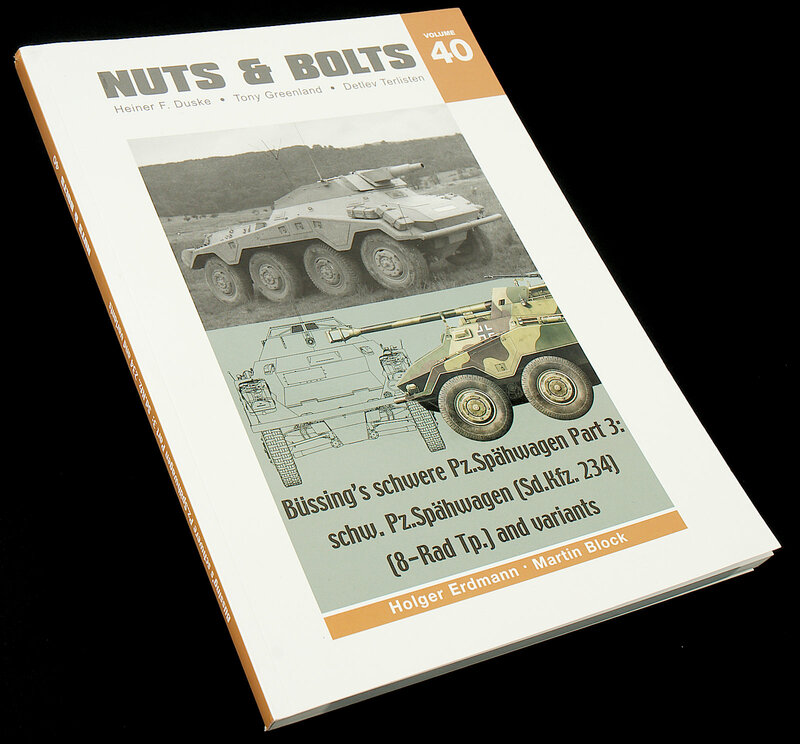 Nuts & Bolts vol 40 is the third book in the series to go into the German 8- wheeled armoured cars of WW2. 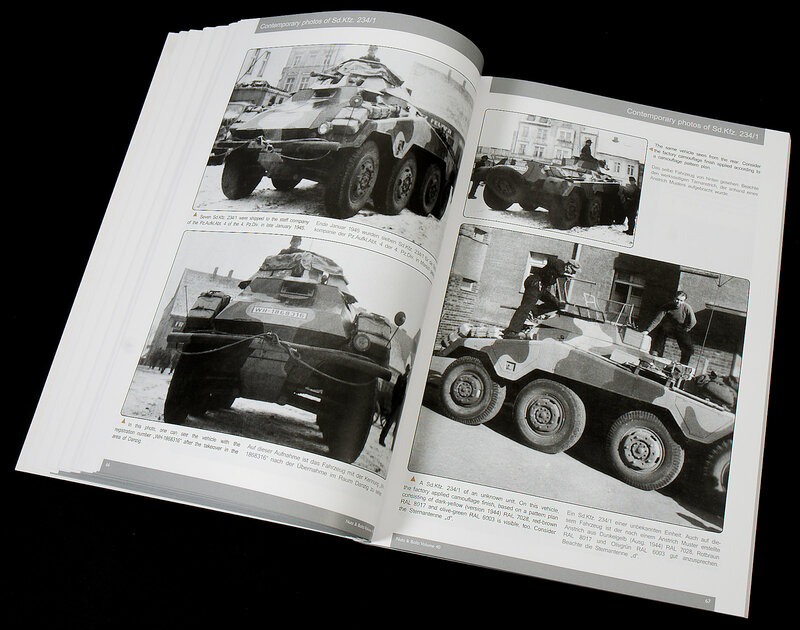 The first two parts covered the earlier SdKfz 231 series’, while this volume goes into the later SdKfz 234 series, of which the Puma is probably the most well-known variant. 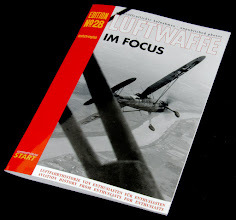 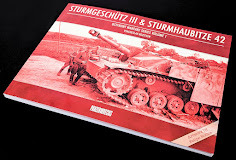 For people familiar with the series, you know exactly what you are getting, which is an informative and comprehensive volume on the subject matter, which in this case covers the four main production variants from the SdKfz 234/1 to 4, and also some of the prototypes. 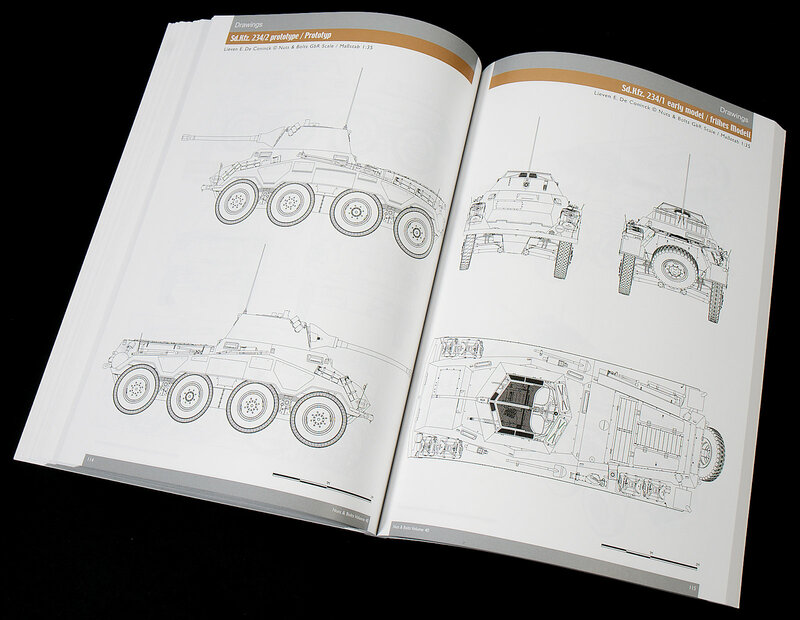 The book starts off on the more technical side covering the development of the vehicle. 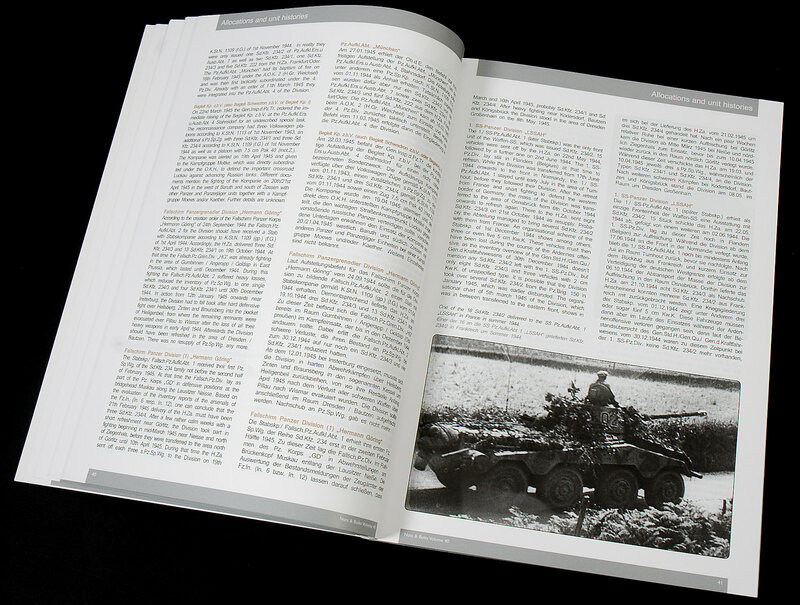 While the text can be quite dry, this is the reason you bought the book in the first place and there is a variety of informative tables and photographs interspersed throughout the text. 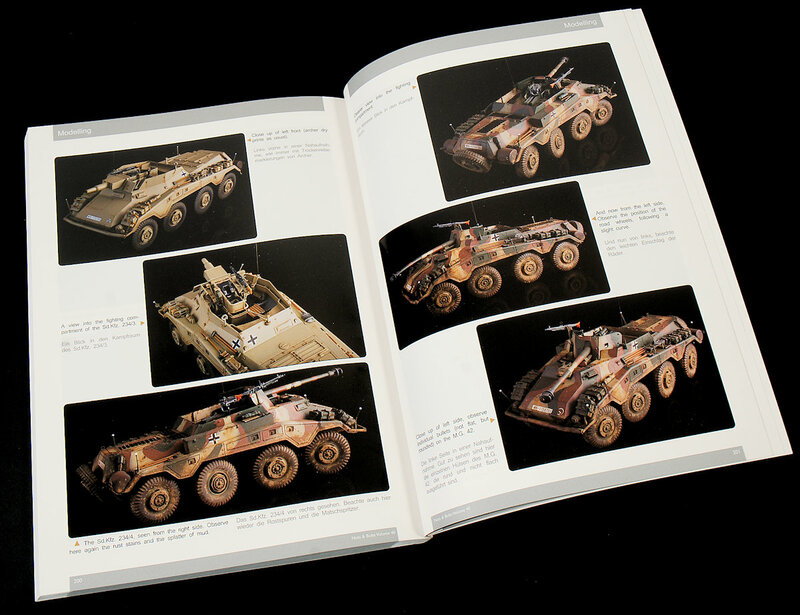 This is the standard format throughout the first half of the book as it moves on to describe the make up of a German reconnaissance unit, as well as the various units and where they served during the war. 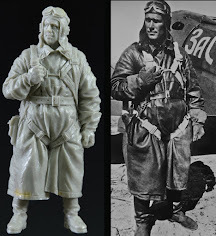 All very useful to those looking for that extra bit of authenticity to their models. 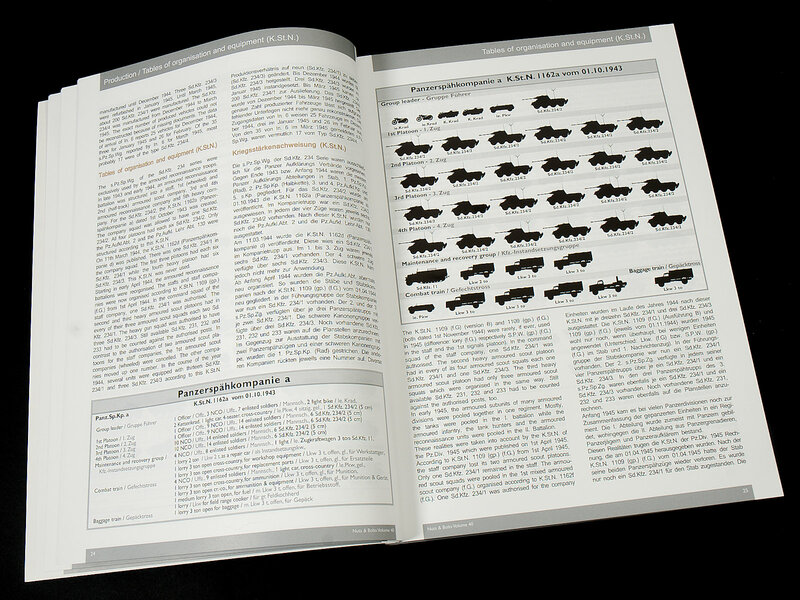 Large blocks of text are included that follow the units who had each type of these vehicles. 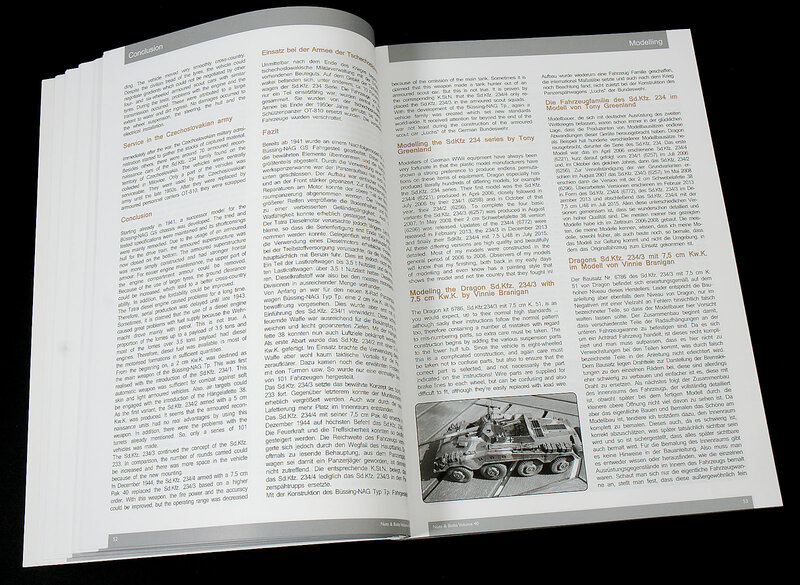 The summaries are pretty concise considering all of the types and units that used each of the many variants. 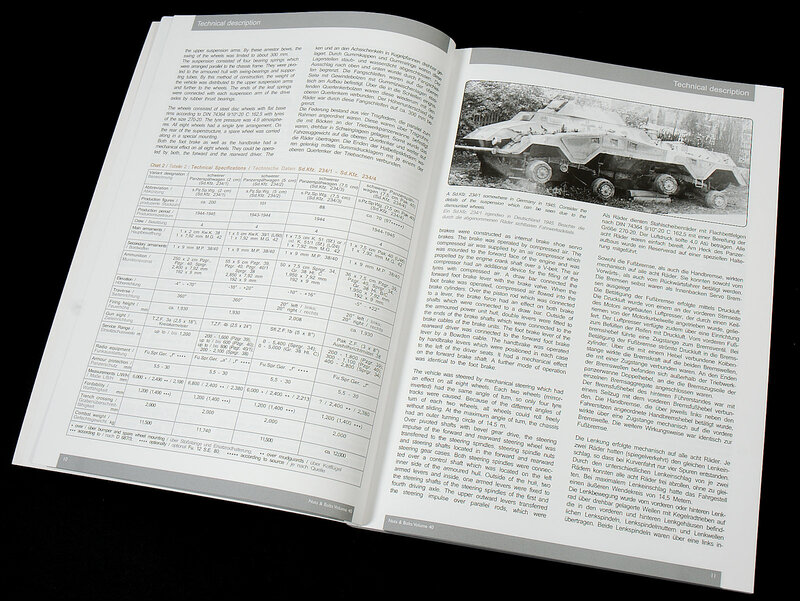 There is a lot of information in here to research and to digest, but it is there in the book for those who want it. 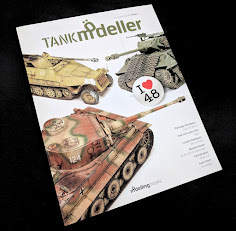 Tony Greenland and Vinnie Brannigan go briefly into the models of the SdKfz 234’s they have built, and there is a table of available kits for the SdKfz 234 family and the various upgrade sets that are available. 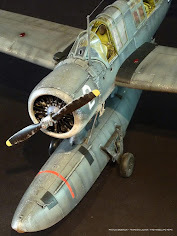 However, there will be more on the models to come later on. 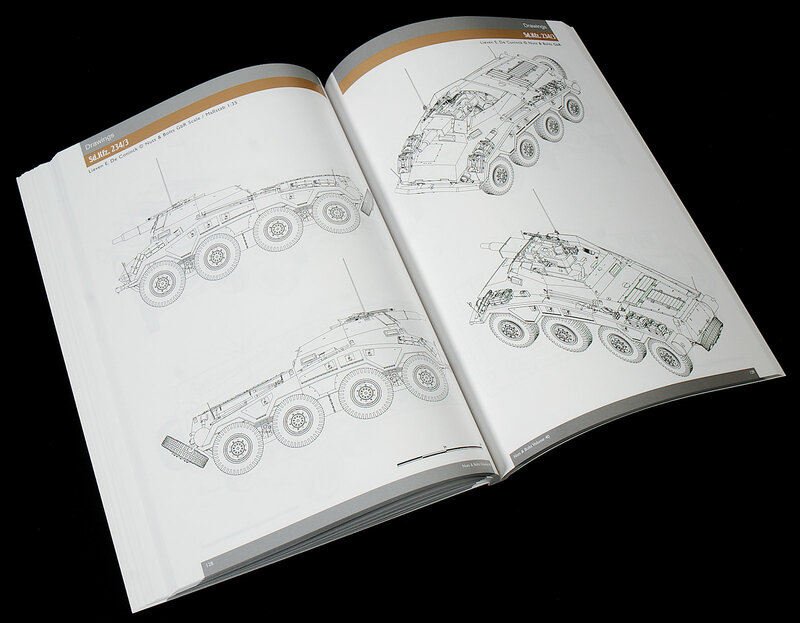 If reading about the technical aspects of armoured vehicles isn’t your thing, then the next few sections are for you with a lot less text and a lot more photographs. 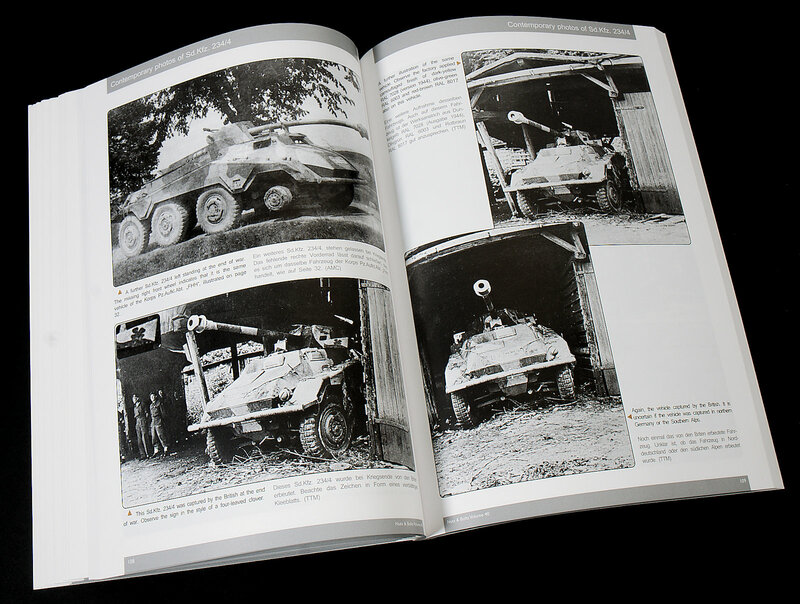 The photos are of the vehicle during the war from its very start undergoing trials to its service during the war. 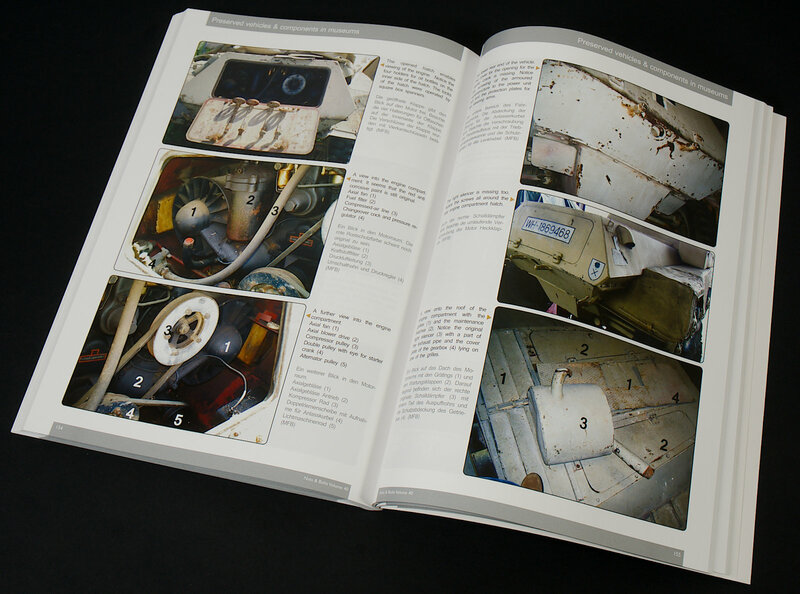 All variants are covered, and there are also photos of various parts of the vehicle. 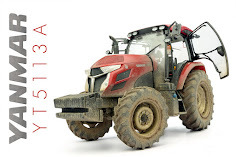 It is rare to see good pictures of these 8 wheelers in action, especially in this high-quality format. 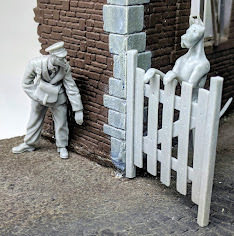 As good as any other pictorial out there, these rare or previously unpublished photos are great for the modeller, this one below in a barn screams diorama. 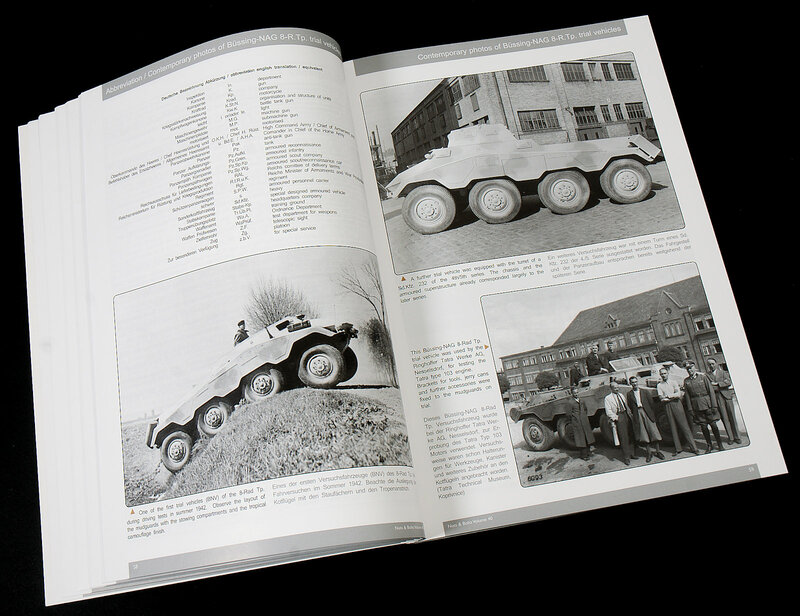 The next section has line drawings of the SdKfz 234, and also colour profiles of vehicles from selected b&w photos throughout the book. 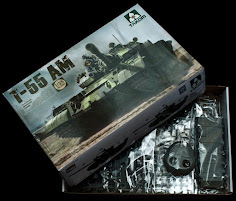 Several different types of vehicles are covered in isometric and plan views, these are in 35th scale for the majority of modellers. 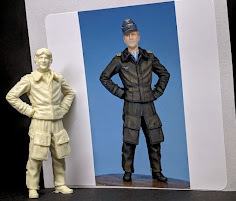 The very good thing that the publisher does with these coloured profiles is they include a small picture of the original beside it. 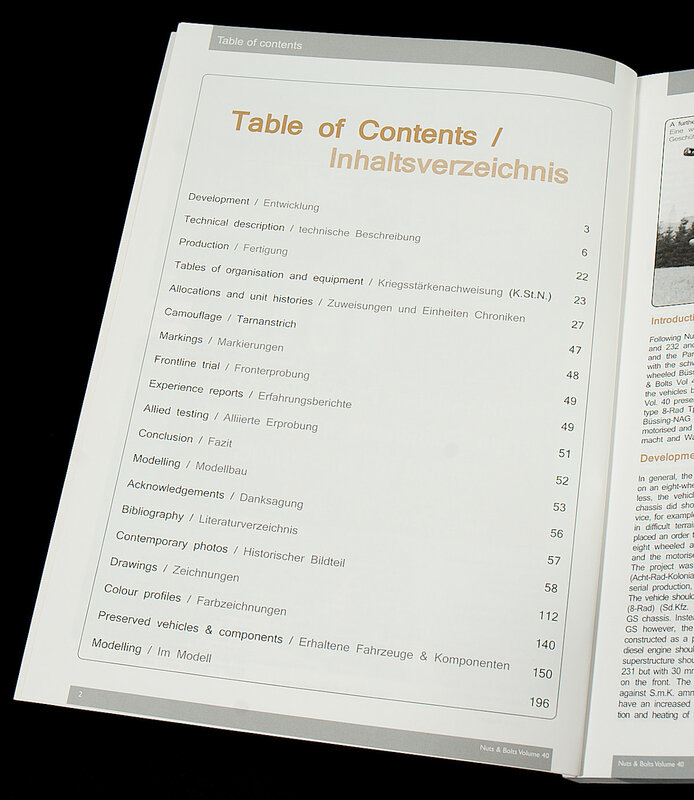 The publishers could make these originals a little larger though. 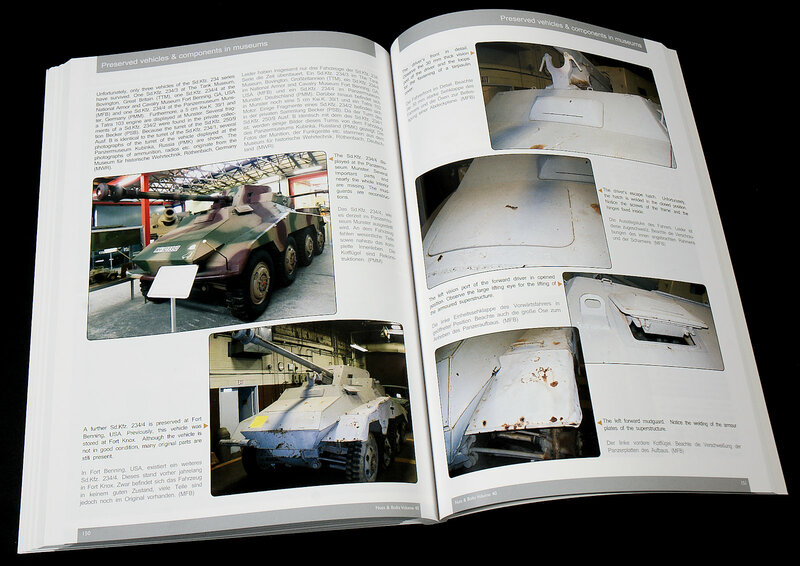 There is a walkaround section with pictures mostly taken from three surviving SdKfz234’s around the world, but also other bits and pieces that have survived the test of time all showing the various elements of the vehicle. 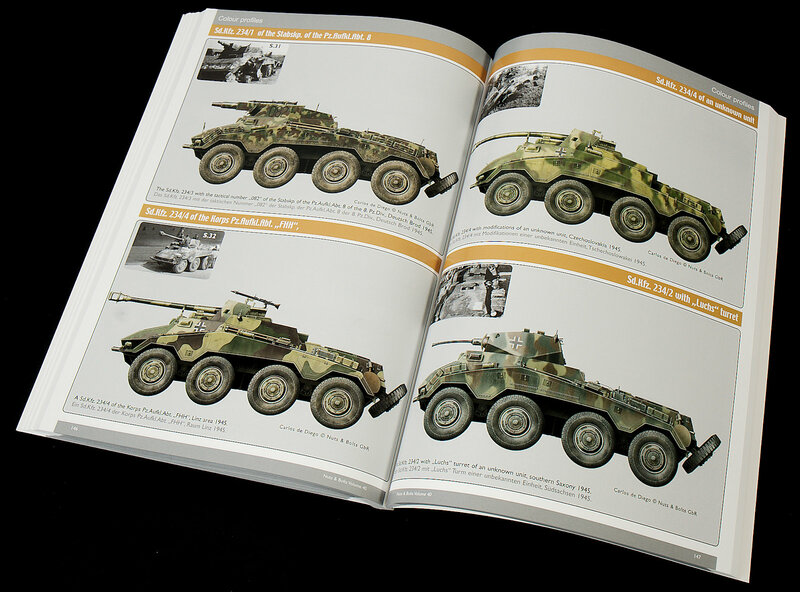 Several types of this rare vehicle are covered, with interiors and exteriors examined with the usual high standard of access and photography. 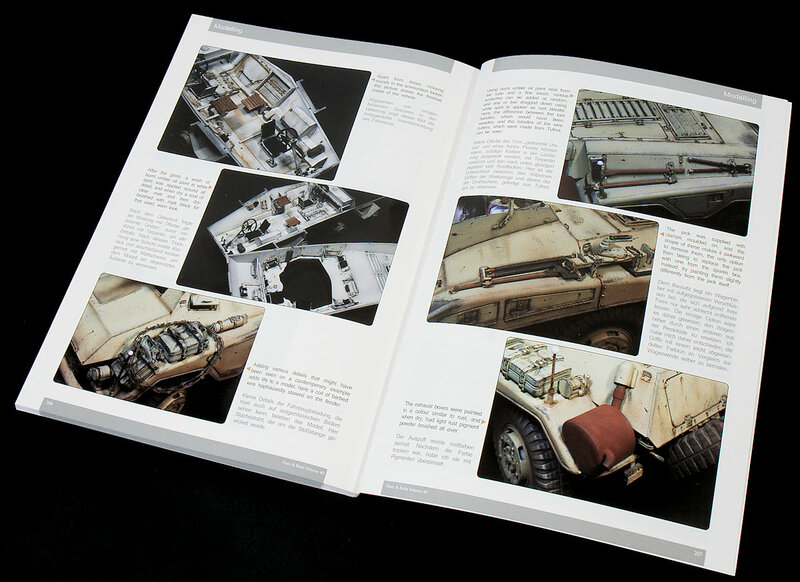 I briefly touched on the models built by Tony Greenland and Vinnie Brannigan earlier, and the book finishes with pictures of the aforementioned models, which are built to a very high standard as usual. 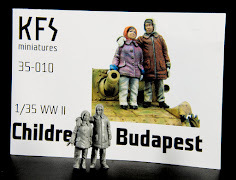 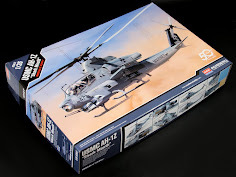 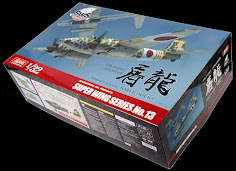 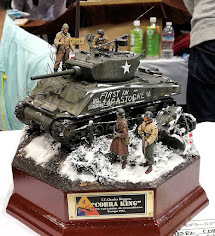 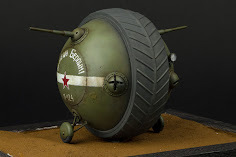 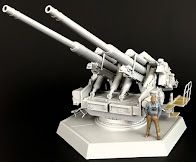 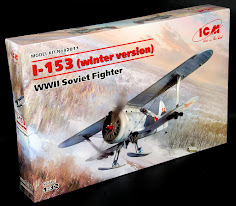 The quality of these models is not to be denied, they are most impressive, while the writing and photography to support them is also top notch. 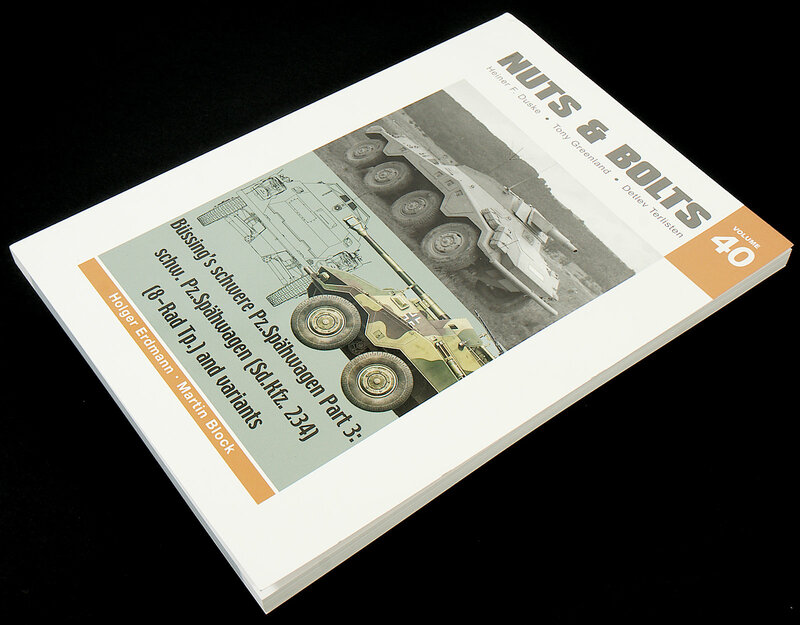 The basic formula to the Nuts & Bolts series doesn’t change, but it doesn’t need to. 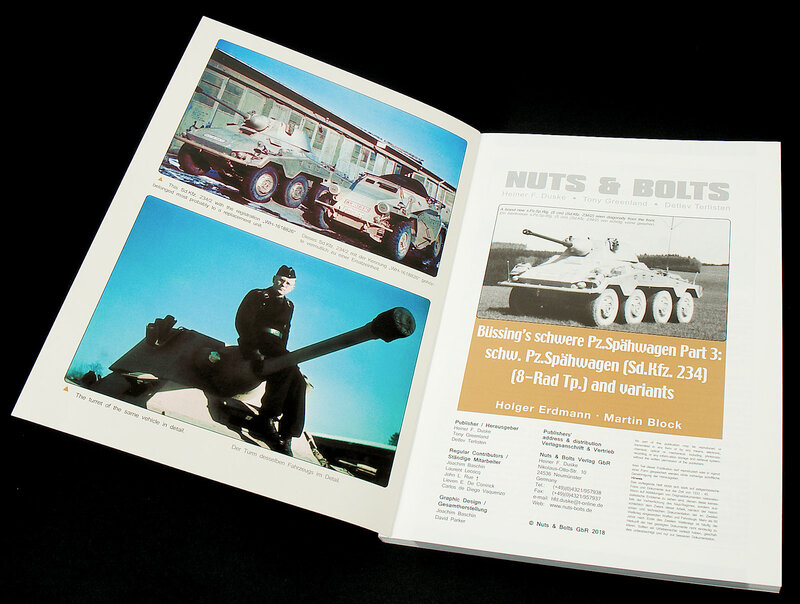 The title of the book tells you what it is about, and what you get is a very informative and comprehensive coverage of the subject matter. 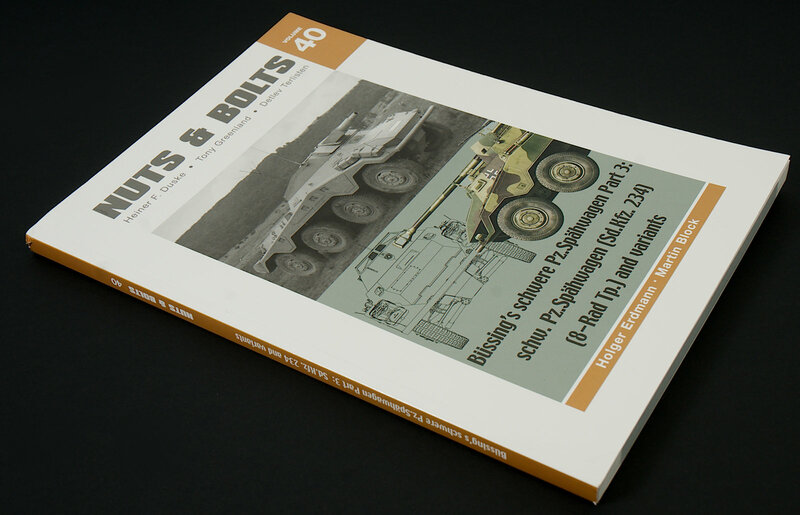 Another great publication and definitely highly recommended to those interested in this series of vehicles.